I’m sure everyone is familiar with the phrase “Carp Angler”, often followed by photos of 20, 30, 40+ pound fish, but has anyone actually considered what defines a carp angler? Is it someone who only targets big commons, mirrors and leathers? Or can the phrase be used in a wider sense? This mini series looks at the different types of fish that come under the carp family as well as their habitats and life cycles and ultimately looks at why we as carp anglers target the fish that we do. When you think of the carp that we see in magazines and other media that the big name anglers catch, only a few varieties come to mind – common carp, mirror carp and leather carp. I know most of you are saying straight away that there are other varieties but they don’t seem to be sought after by the majority of carp anglers, these include koi, grass, ghost, crucian and F1 carp. So why when we classify carp anglers do we not include the anglers that mainly fish for crucian or F1 carp? 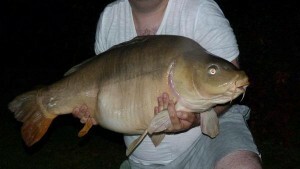 These fish are usually the prize of match anglers but why not carp anglers? As with all carp and in fact all fish, catching a large amount is easy if you know how but catching a specimen requires the same amount of skill for any angler no matter what species you target. For a better understanding of the fish within the carp family and to work out what really makes a carp angler lets have a look at the different varieties of carp that we have in British waters. I’ve listed many below but it’s worth noting that mirror, common, leather, koi and ghost carp are all different varieties of the same species, Cyprinus carpio. Common carp can be identified by its regular scale pattern over its whole body and 2 barbules on each side of its mouth. They are often long and lean. Although the name suggests they are common, most fisheries choose to stock more mirrors than commons. This along with the fact that a big common is rarer than a big mirror makes common carp a target and true prize to most carp anglers. Size – Currently the largest common caught in Britain weighs in at 64lb. The largest common carp in the world is thought to weigh in at 100lb and 8oz and was caught in 2013 in France. 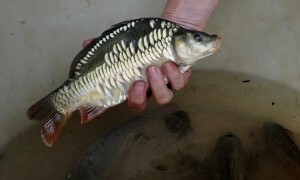 Mirror carp can be identified by irregular scales dotted over its body, although anglers have subdivided the scale patterns to make them easily identifiable – linear mirrors have a continuous line of scales along their lateral line whereas fully scaled mirrors are completely covered in scales of different sizes. Mirror carp also tend to have a fuller, more rounded shape than common carp. Size – The current British record mirror carp weighs in at 67lb 14oz and the world record is a massive 101lb 4oz. Leather carp can be identified by its lack of scales and an almost leather effect skin, although they are allowed some scales along the dorsal line and at the wrist of the tail. Most people believe that leather carp are simply mirror carp without scales but this is untrue, leather carp are proven to be genetically different from mirror carp. Size – Leather carp also have reduced numbers of red blood cells, this can slow their growth, making large Leather Carp rare and very much sought after. Due to the rarity of these carp there isn’t much information available about the specimen leather carp in the UK although one of the largest (quite possibly the largest) was a carp known as ‘Heather the Leather’ weighing in at 54lb 8oz. 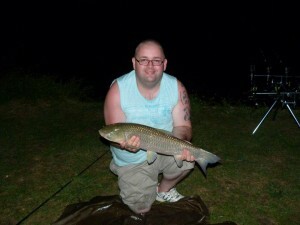 Grass carp are another variety of carp that is becoming increasingly more common in British waters. These fish, originating in Siberia and China, were originally introduced to European fisheries as a means of weed control. Initially it was believed that they ignored anglers bait, choosing to eat vegetation instead. However, soon after their introduction this belief was dismissed as they showed an interest in conventional fishing baits. Grass carp typically have long slender bodies, rounded heads and do not have any barbules and are fairly similar to chub in their overall shape. 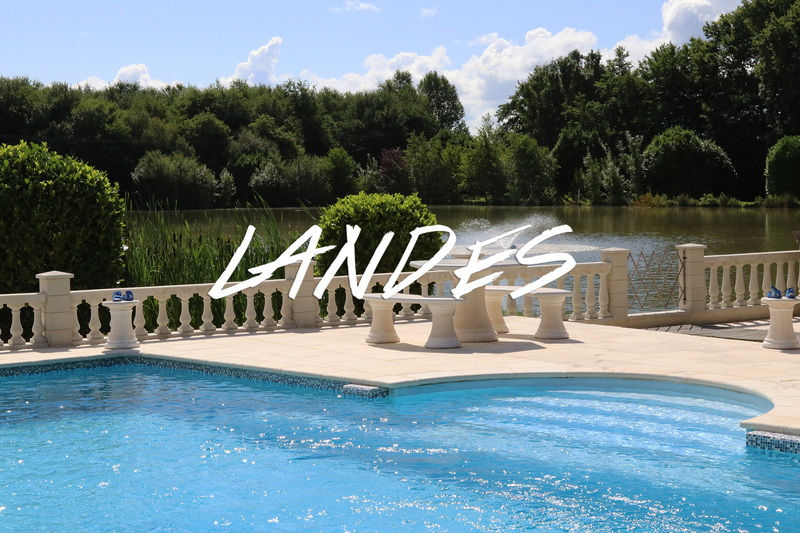 Some carp fishing in France lakes stock a small amount of young grass carp to keep the weed under control and they act as effective house-keeping. Size – They grow rapidly and can gain 10lb in a year. The last recorded British grass carp record stands at 44lb 8oz, although the list was closed for accepting new record applications for grass carp in 2007 so by now there must be bigger UK grass carp out there! Ghost carp Another variety of carp that is quite common throughout the UK, these are technically a hybrid as a result of breeding mirror or common carp with koi carp. Their scales have a metallic sheen and often come in shades of gold, silver and white. To produce a white ghost carp the koi is usually a purachina koi and to produce a yellow ghost carp the koi is usually a yambuki koi. Size – As Ghost Carp are both a hybrid and ornamental there is no current record registered but one of the largest known weighed in at 41lb 3oz. Koi carp As we have gone over ghost carp it would be rude not to go over the koi. A relation of the common carp and naturally brown, selective breeding by the Japanese has lead to koi of all different colours and patterns being produced. Koi are purely an ornamental fish, but you’ll find that a few have been stocked into fisheries up and down the country, going on to breed with other carp to produce the aforementioned ghost carp. Size – Koi can typically grow to weights of up to 35lbs in the right conditions. 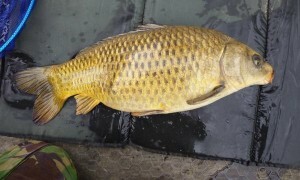 The F1 Carp Now we head to a slightly smaller breed of carp that is relatively new to the UK but is fast becoming the most stocked variety, F1 Carp which are a hybrid of common carp and crucian carp. While this cross breeding can occur naturally in the wild it is now more often taking place artificially at fish farms. There is plenty of confusion as to what an F1 Carp really is as they look very similar to commons with their overall shape. 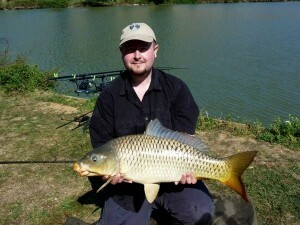 The barbules; whereas common carp have four, F1 carp only have 2 and they are usually smaller than those on a Common Carp. The second point requires a closer inspection, the number of lateral line scales on a F1 Carp is usually 35 or 36, which is higher than those found on a Crucian Carp (around 32 to 34). Size – F1 Carp are usually faster growing than any other carp and reach a weight of between 6 and 9lb They also tend to continue feeding in colder water when other fish slow down. Due to their size and fast growth rates it is easy to see why many fisheries and match fishermen love them. Crucian carp Finally we get to the smallest of the Carp found in British waters, the Crucian Carp. Although, again, very similar to common carp the crucian carp does not have any barbules and rarely weigh much over 3lbs. Crucian carp are usually found in ponds and lakes rather than running waters and can survive in poor quality water with little oxygen. Now that we have gone through the main carp sub-species found in British waters the question comes round again, what makes a ‘carp angler’? We’ve seen a varied collection of carp, do carp anglers only aim for the bigger specimen? Or can they focus mainly on crucian and F1 carp if they wished? In my opinion a true carp angler is one who fishes for any of the above, treats the fish with the respect they deserve and takes pleasure from catching these magnificent fish. 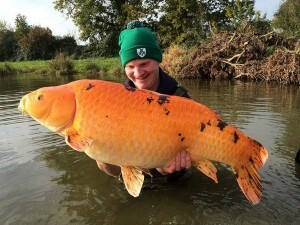 It would not be unusual for a Koi to breed with a Mirror Carp, I have seen a few photos of them here and there so I guess the answer to your question is Yes. The koi he bought may be a German original which has be enjoyed by the Japanese breeders re ently…called Doutsu, but pronounced Dotz. There are 3 types if Doitsu koi. It has scales on back only. 2. Kawas goi…no scales, comes from the leather carp, except sometimes a few on top and wrist of tail. Leather carp are very rare carp in natural environments. 3. Kagami goi…. scales on back and sides. Come from the mirror carp. They have a full round shape.